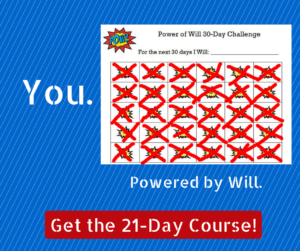 Welcome to your instructions for the Power of Will 30-Day Planner! This document is designed to help you strengthen your Power of Will faster and more thoroughly then you may have thought possible. It is best used in conjunction with the 30-Day Power of Will Challenge worksheet (also in the Member’s Area). That’s the simple calendar where you experience the joy of marking off every day you complete a segment of your goal. It is fun and helps you build momentum while you are working on your personal projects. The 30-Day planner, in conjunction with the Challenge, is designed to help you dig deeper into your motivation and burgeoning Power of Will to become even more effective. The core exercise in the planner are the five daily questions. And you may be familiar with some of them from different disciplines. The first two questions are traditional goalsetting material. The second two come from the world of project management – and they are designed to keep you on track and build momentum as you work toward your goal. The fifth question is specific to the field of Willpower. And that question may wind up being the most important for you and I’ll return to that in a moment after I explain the first four. The first daily question is, “What is your goal?” And this is where you write down your intention every single day. This helps reminds you what you’re aiming toward. The second daily question is, “Why do you want to achieve this goal?” And again this is designed to help you remember – and even build upon – your reason for what you were doing. Take some time answering this question every day. You probably know that having a purpose – a burning desire – to achieve something is excellent fuel to keep you going toward where you want to be. The third question, “What did you do yesterday?,” is a prompt to give you a chance to recall your accomplishment from the previous day. This helps you remember that you are already working toward your desire – and that you are already building up results. And it may be that all you did yesterday was think about your goal and dedicate yourself to achieving it. This is a legitimate answer because it leads you to the next question. This is where you write down the one or two or three things you’re going to do toward your goal which as you will see in the worksheet is directly above this question. In effect you are proving to yourself that you are moving and taking action toward what you say you were going to do. The fifth question, “How can you use your will to achieve your goal?,” is where you can think about your own capacity. Definitely write down the things you are good at. You may be enthusiastic and you can write, “I will keep my enthusiasm high.” You may be talented or accomplished in your field and you can write that you will continue to develop your skill. Answering this question honestly and thoughtfully over the course of several days will give you the clue you need as to what area of Willpower you need to concentrate on to accomplish your goal. And there are no right or wrong answers. There is no good or bad. Everyone has skills and abilities and areas where they can improve. And if you are following this program you know that there is more to this than just simply accomplishing a goal. You want to increase and strengthen your Power of Will while you are doing so because you know it has a knock-on effect. You know that it will help you in general as well as with future goals. 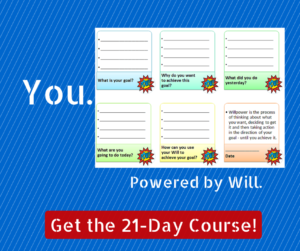 And the best way to get the most out of this last question is to bring it forward with you as you continue in your 30-Day power of Will planner. The following day and days you can make sure that you answer the fourth question, “What are you go going to do today?” with the material you have put down on previous days from question number five. Going forward – taking just a few minutes every day to answer these five daily questions will keep you on track with your goal. It will help maintain your motivation and your focus. It will seem every day as if you are actually accomplishing your goal. Because you are. Being engaged with your goal and the Power of Will 30-Day Planner every single day means you are doing what you said you were going to do. And yes, at the end of 30 days you will have accomplished your stated goal. And you will have accomplished the goal of strengthening your Power of Will. It’s easy, it’s fun and it works. Good luck! Remember, you can access the Power of Will 30-Day Planner in the Member’s Area – and you can gain access by clicking here.